The first edition of the Speedliter's handbook is still one of the most comprehensive guides for understanding light, getting to know the Canon Speedlites and the application(s) of Speedlite flash in various lighting environments. The second edition of the Speedliter's Handbook is refreshed to not only include the Canon Speedlite 600EX-RT, but the various updates and improvements will assist the developing photographer even more in understanding and mastering Speedlite flash. Syl Arena also shares his own personal growth and learning on how he's applying flash and lighting to his own photography. This book is one of those 'must have's' if you're serious about taking your flash photography to the next level - or just want to get 'up to speed' with Canon's Speedlites, its various applications and benefits over the built-in pop-up flash. 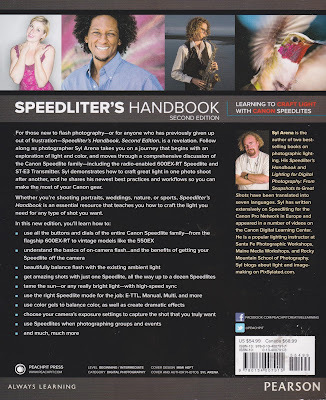 As with the first edition I highly recommend the Speedliter's Handbook second edition for anybody who wants to get more involved with Speedlite flash photography on / or off their Canon EOS and / or compatible Canon PowerShot (G and various SX models) camera. The Speedliter's Handbook should be an essential resource guide for assisting both the amateur and professional Canon EOS DSLR photographer with extracting maximum value from using basic Speedlite flash applications to managing multiple Speedlites in a variety of challenging lighting environments. In this book you will find 400+ pages packed with everything that is required to learn and understand the current range of Canon Speedlites and how to use them. Coverage of how to use the radio-enabled 600EX-RT system by itself and with earlier generations of Canon Speedlites.